Information Architecture, as we define it, has applications on 3 scales: small – the object or building; medium – the village or urban district; large – the city or territory. It builds on the assumption that there exist information structures –stable or dynamic – that represent crucial properties of architecture, settlements and territories. Based on this assumption, Information Architecture supports integrated trans-scalar design and evaluation, and it helps to make the invisible visible on each one of those scales. Simulation and visualisation are the major tools of Information Architecture. Both require appropriate abstraction and representation. Data and information are the raw materials of Information Architecture. What sounds very complicated, is actually quite simple given the proper introduction and instruments. On all scales, we use form, function, dynamics and geometric references as information structures. On the architectural scale, this helps to visualise surfaces, light, sound, structural behaviour, and economic aspects, and leads to a life-cycle view of the building. On the urban design scale, land use and building codes are additional parameters that, combined with the necessary procedural modelling tools, lead to dynamic and interactive city models. On the territorial planning scale, transportation networks and energy grids form additional information structures. One of the main research questions remains the improvement of the interoperability between information structures at different scales, because solving this question will allow for integrated simulation of the most important aspects of architecture and planning. 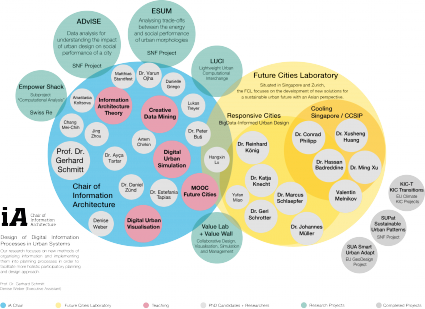 The Chair for Information Architecture is at the core of the simulation platform for the Future Cities Laboratory in Singapore and Zürich. This platform will allow for the integrated modelling and visualisation of the stocks and flows that determine architecture, cities, and territories: people, material, water, energy, finances, space and information. The final goal is to educate architects, designers and planners in the use of the new methods and instruments in order to produce more sustainable and responsible buildings and urban-rural systems.